This was my very first grinder. I bought it back in 2011. Not sure what makes this "advanced," but this is a decent grinder. It doesn't produce particularly consistent grinds, nor particular inconsistent grinds, which I think is pretty normal for inexpensive manual grinders. Not shown is a little screw-on-lid for the lower chamber, should you grind too many beans, though that's not a selling point for me, as I only grind enough for one brewing at a time. Handle stays on, and is a nice length. Newer models may come with a lid - do your homework. Can screw onto a narrow-mouth canning jar (I haven't tried it, though). Ergonomics are a little awkward. Too big to hold in your hand conveniently, too small to grip between your thighs to hold it steady. No lid. Bean bits jump out of the hopper. Adjusting the coarseness of the grind is inconvenient. You unscrew the bolt that holds the handle on, lift up this little toothed thing, twist the shaft to loosen or tighten the grind, put the toothed thing back on, then the handle, then screw the bolt back on. Lots of trial and error, but that's not a big deal if you don't intend to change the settings. 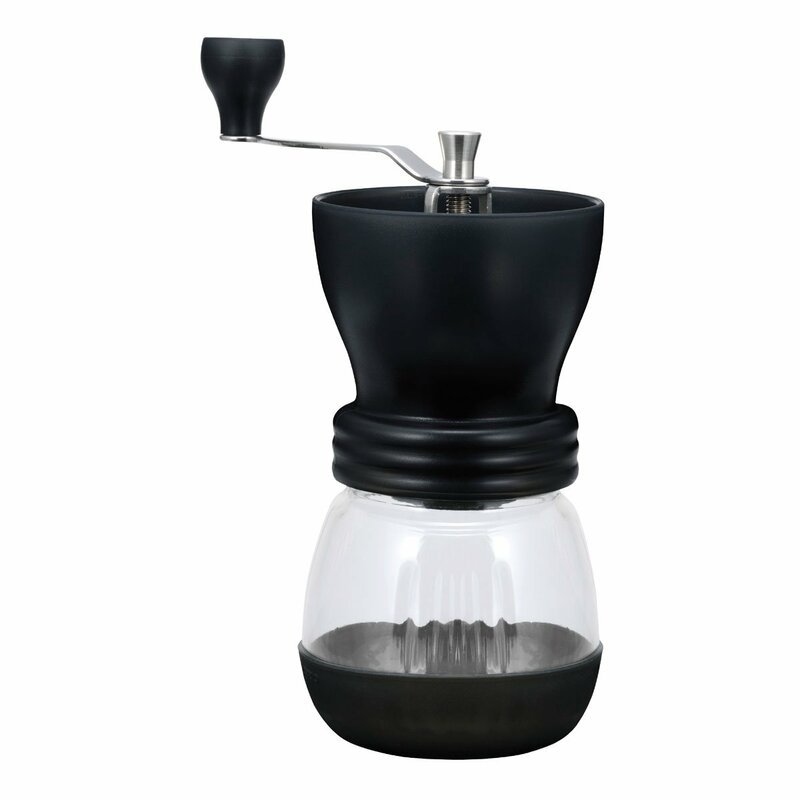 Honestly, if you like the looks of this grinder, I'd consider getting the Hario Ceramic Coffee Mill Skerton. It looks to be exactly like this one, but has higher ratings (actually, they have same rating - 4.3 out of 5 - but double the number of people have rated it), is about $6 cheaper at the moment, and has a LID. Interestingly, I sold this grinder to a friend of mine who intended it to live in her camper for weekend trips. It's the first and only package I've ever had go missing. Opened an investigation and everything - evidently the box got crushed, and the parts separated from each other. The USPS sent me the mailing labels from it with an "oops, sorry" note. The irony? The friend it was going to is a postal carrier. I felt so bad, I sent her my second grinder after I upgraded it.